It is copyright © Bobbi Lurie and Jacket magazine 2010. See our [»»] Copyright notice. Amy King’s poems are dense and energetically written. They are often fragmented collages of narratives which are in no way narratives in the usual sense. They express a great deal of movement of the mind, written with a strong imagination and unexpected twists. The structure of her poems are consistently rendered as if to help contain a wild mind. She culled her amputee notes. and the iris backwashing the tomb. Cindy Sherman, Nan Goldin and Diane Arbus are all photographers who were pupils of Cahun’s (whether they knew it or not since Cahun’s stunning work has only recently become known) and their kingdom was and is, like Cahun’s, from the pupil, the eye. 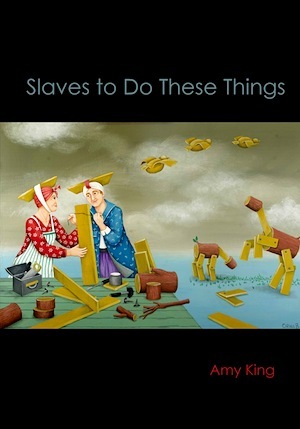 “Slaves to Do These Things,” is divided into five “acts” introduced by quotes from Cesar Vallejo, Betty Smith, Claude Cahun, Dora Maar and Virgil. In Act I, the quote from Cesar Vallejo, “The soul that suffered from being its body… ” is followed by a poem titled “The Psalms Called “Breath” where King examines human suffering and injustice while sticking to the visual images which empower her work. A portion of “The Psalms Called “Breath” illustrates how the soul does suffer from being its body… . would render the spirit deaf? of a bacterial armpit safari. awake with all that hurt us. But my heart is not. This nowness of the heart very much describes many aspects of “Slaves to Do These Things.” The heart is now. We are alive in the now. This book is alive in the now, dynamically filled with the presence of the senses, with alterations in thoughts as they appear in the mind which can be interpreted in multiple ways along with the joy of rhyme, reason and non-reason. This is a book which invites multiple readings. Bobbi Lurie’s third poetry collection, Grief suite, will be published by CW Books in May, 2010. Her other collections are The Book I Never Read and Letter from the Lawn.